How did your company begin and what areas do you serve? With $400.00 and perseverance. We are headquartered in Arizona and serve mainly the Phoenix, Scottsdale, and entire Maricopa County area. We also go into New Mexico, Texas, and California for some contracts that we have. We decided to diversify from pressure washing, and then cultivate to a full service provider. What are your total employees and office locations? For the administration staff it’s five people total. The daytime crew of Mechanics/Maintenance/Sweeping/Power Washing Techs and Day Porters are about 21, and the night Supervisors/Maintenance/Sweeping/Power Washing Techs total 26. We have offices in Chandler, Arizona and one in Fort Worth, Texas. No growth within the last few years, but we have shown a 15% growth in the last 9 months. Have you added on any recent services lately that are new to your brand? 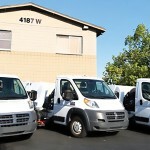 We are a full service facility that is growing in the garage service capacity of our business. Some of main services we offer are hot water and steam pressure washing, exterior custodial services, building facade and window washing, and of course parking lot and street sweeping. We’re a one-stop shop for all property maintenance. With the ability to service large contracts extremely fast while not compromising quality. Luckily we have years of experience and thousands of happy clients. Tell me a little bit about the daily operations and how your workers shifts run for you? All our employees are equipped with company iPads that provide organization to our operations, oversee worker timekeeping, run operational reports, view route statistics, and much more. This ensures our 24-hour, seven days a week operations run seamless to provide the customer the best service possible. What kind of policies and regulations do you have when it comes to environmental issues that are important to your company? Always do what’s right even when the competition is not. We are EPA and CWA compliant of course. We also reclaim, filter out and try to reuse as much of the water waste that goes through our trucks to limit the amount of added water consumption. All of our pressure washing is also chemical-free as well. How much do new technologies make a difference for your business in particular? Tons! Technology is always advancing and we will continue to progress with technology to provide services that are needed at a level that is expected.